Some really cool stuff as always. What did people think of the prices realized? I keep spending too much in these RMY auctions, but how can you resist? Last edited by Runscott; 09-10-2018 at 03:51 PM. I love that Mordecai photo, nice pick up! Thought I did well with the New York Giants material I was after. Didn't win 'em all but I'm happy . Hi Sean. My research showed exactly what you found, except I did not know the Cubs wore the Whales jerseys. 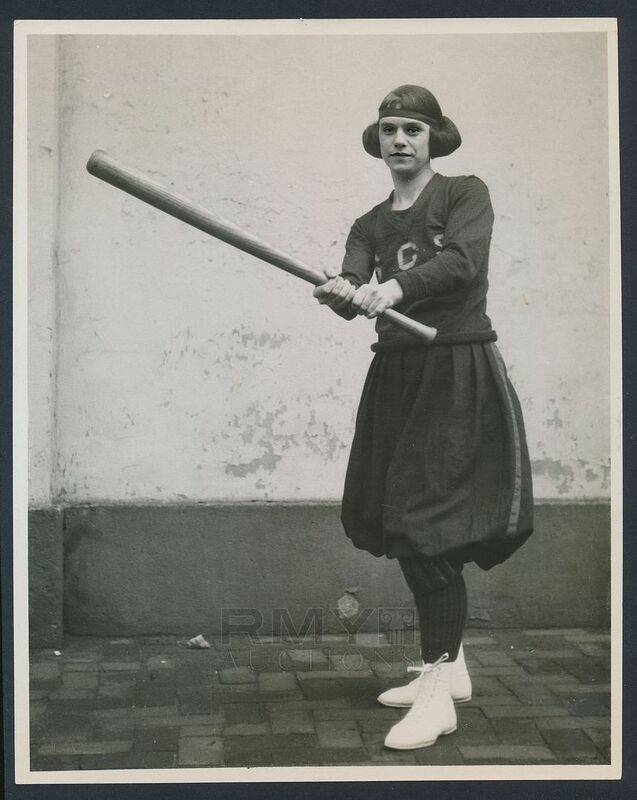 I feel better knowing that as the stamp and Lavender now make sense - I was concerned that someone might have doctored the logo on the print, as the socks,caps, undershirt all matched 1916 Cubs unis. Thanks. Last edited by Runscott; 03-11-2018 at 01:41 PM. Also, Rhys' scan indicates a very sharp image. I will post a hi-res scan when the print arrives. I picked up the Spahn pre-rookie well below my high bid. The 1904 Matty went $1500 below where it went last time. The Bustin Babe/ Gehrig went strong. Paul, Great pickup on the Spahn. Scott.. brown photo is cool/rare. I added to my T205 photo set. Unfortunately i am traveling and at a work convention. Therefore, i had to put high bids in. I hate doing that vs bidding at end.. never a plus. Somone kept creeping the bids all the way up. I was still able to get 4 of 5 though. The winning bidder sure wanted the Tannehill - they deserve it at that price. I think these sure are neat though. 1-colorful set + 2 i love my portraits= 3 I’m a sucker for them. Thanks Ben. Great pick-ups for your T205 set. Yes, putting in high bids at RMY and walking away will absolutely kill you. I did it on about five pieces, then slapped myself and opened a beer. I just could stay up long enough last night. I thought I put in high enough max bids on the 8 or so lots I was bidding on. This morning I learned I only won one lot (the 1927 Forbes Field photo). If anyone on here won the Greenberg in a Pirates uniform, I am highly interested in it. I thought I raised my max on that one, but I obviously did not. I love the Brown Scott!! Great pickups as always Ben! I think some went cheap and some went strong just like every rmy auction. I think Whoever paid $440 for a ku klux clan photo paid 440 too much. Missed a few that I wanted but managed to get the Ruth Steinhagen photo to go along with my Eddie Waitkus photo. Last edited by eastonfalcon19; 03-11-2018 at 05:04 PM. Glad you got it - I was the underbidder, just because it is a cool photo. 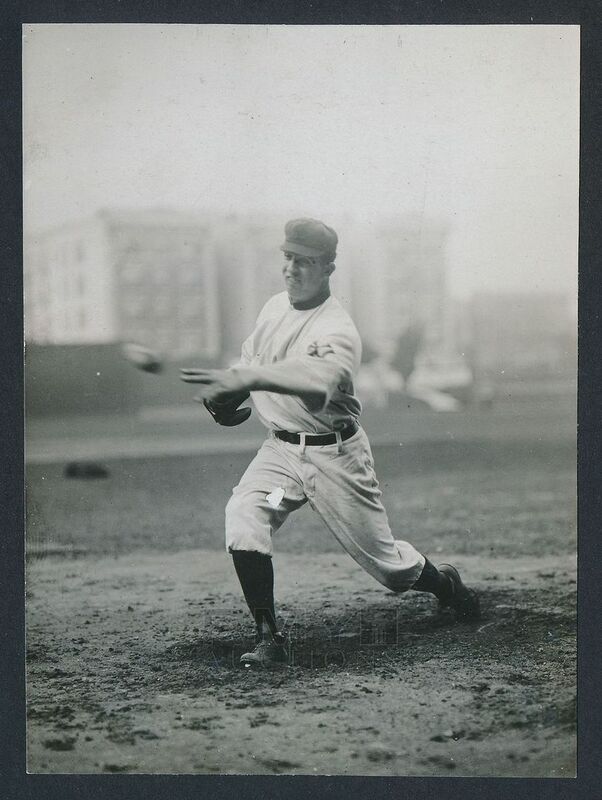 Not to start an argument, but I bid on a lot of photos and would have bid on about twice that number, but I cannot bid on trimmed photos unless there is a very, very compelling reason. When I see perfectly sharp edges and words are cut off the back, I move on. I think most collectors feel the same way. 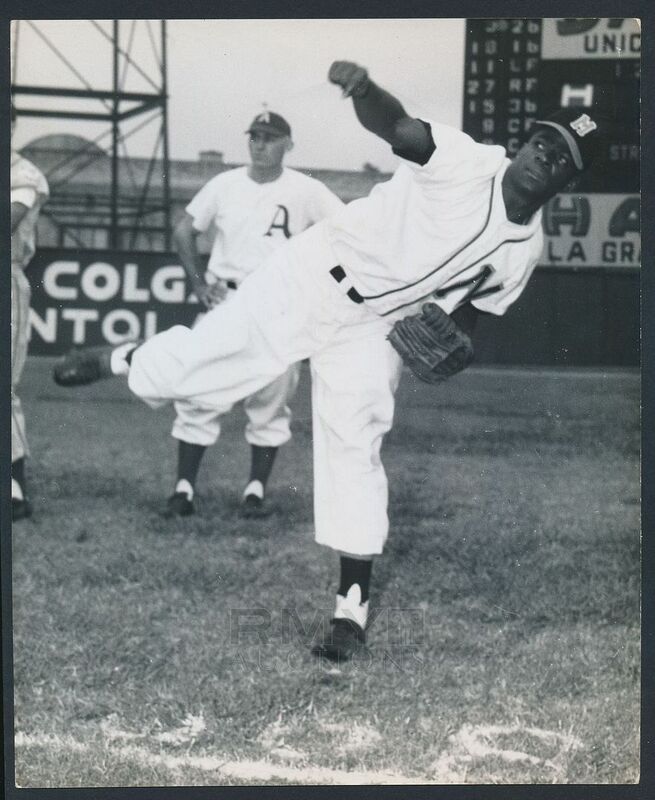 I would not have bid on the Joe Jackson photo, just because it's out of my price range, but it's a perfect example. It might now be better for slabbing, but display is now out of the question. Thank you Scott for not going any higher lol it went up to my last auto bid so I got lucky on that one. Been getting more and more into vintage photos/snapshots, like the idea of having something a little more unique.Tried for 4 or 5 items but again out gunned. Did manage to acquire a small photo of the N Orleans Pelican field with game action circa 1910. Thinking of matching it up with a Jackson auto and maybe one of those "10" Pelican tickets that pop up once in a while. Hilarious - I was the underbidder on that one also. Maybe two back if it got a late bid. Crazy. One I sort of regret not going higher on was the Cobb Cadillac piece. I liked the hyping of it as a potential new catalogued card. I thought the rookie Sisler by Paul Thompson would go higher. A cool photo. Almost half as much as the Jeffrey Dahmer mugshot and 40 bucks less than a pic of white hooded thugs. Weird. Just love the game action of this one. Not posed at all. Tough to find a shot like this. 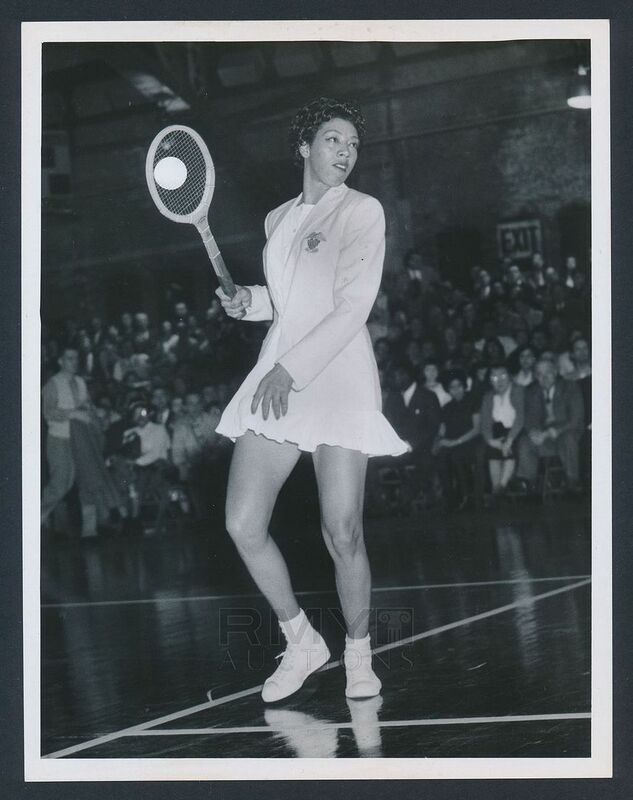 And the vastly underappreciated Althea Gibson. She lived in my neck of the woods when I was growing up. Love the third one. Super cool. I agree with you Scott. I thought about upping my bid on the Cobbie myself. Cool photo! I like all of these. That first one is one of those you keep looking at. Very nice. Congrats to you. All great photos, thanks for sharing. I especially like the girl batting. Last edited by Leon; 03-16-2018 at 10:39 AM.